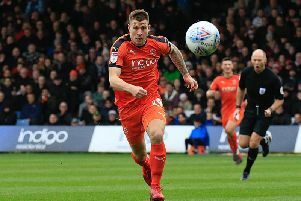 Luton took a huge forward step in the race for automatic promotion this evening, as George Moncur's glorious late free kick saw them beat nearest rivals Portsmouth in an absolutely thrilling clash at Kenilworth Road. Twice the Hatters led, and twice they were hauled back, before with just four minutes to go, Moncur stepped up curl his set-piece around the wall and into the bottom corner to send the home fans into raptures on a quite unforgettable evening. The result saw Town move five points clear of their south coast rivals, and six ahead of Barnsley in third, who were held by Oxford United, ahead of a trip to Shrewsbury this weekend and extend their unbeaten league run to staggering 17 matches. It was also their first league victory against Pompey for over 20 years, their last success back in 1995, some seven games ago. Interim boss Mick Harford named an unchanged side for the third game running, although youngsters Connor Tomlinson and Arthur Read were on the bench, as George Thorne and Aaron Jarvis were unavailable. With the snow forecast arriving just before kick-off, Luton adapted far quicker to the slippy conditions, Jack Stacey firing an early effort over from 20 yards, James Justin's low effort smuggled away by Craig MacGillivray. Despite the tricky surface, Luton played some magnificent stuff in the opening 20 minutes, always to feet and working the angles, just unable to create that clear-cut chance for their strikers. Kazenga LuaLua took aim, MacGillivray blocking with his legs, while Luke Berry didn't missing the far post by much from distance. Berry also went close with his head after Stacey skated round his marker and put in a cross that the midfielder glanced wide. McCormack almost lit the touchpaper with an instinctive 30-yarder that only just bent away from goal with MacGillivray rooted to the spot. For all Luton's excellent interplay, their best chance came via a long ball over the top which LuaLua raced on to, although bearing down on goal, he took a heavy touch and then a weak finish made it easy for the keeper. However, Town were not to be denied, as on 40 minutes, McCormack won the ball back, fed Stacey, who set off and found LuaLua. He spun away to play in Collins, Luton's top scorer not breaking stride, caressing an effort into the bottom corner for quite possibly the most deserved goal of the season. Luton almost had a second on the stroke of half time, Collins charging down MacGillivray's clearance and LuaLua just about crowded out by the covering defence. Visiting boss Kenny Jackett responded to his side's woeful first half display, bringing on new signing Omar Bogle and Dion Donohue, with the latter immediately testing Shea from the edge of the box. Clearly having had a rocket from their manager, the visitors came out full of spirit and were level just five minutes in, Ronan Curtis finding the bottom corner. Shea kept his side level moments later, showing superb reflexes to touch Bryn Morris' blast over the bar, also repelling Curtis's near post blast. Luton recovered the composure, with Justin's dipping effort from 25 yards flipped over by the keeper. The Hatters then looked odds on for victory with 13 minutes to go as LuaLua went over Jack Whatmough's challenge in the box, Collins blasting home the spotkick. But, in very unlike Luton moment, they then conceded just seconds later, a really scrappy goal too, Bogle tapping home from two yards out. Bogle almost had a second straight away, clean through, Shea crucially saving with his legs. Hatters: James Shea, Jack Stacey, James Justin, Matty Pearson, Sonny Bradley (C), Alan McCormack, Pelly-Ruddock Mpanzu, Andrew Shinnie (Alan Sheehan 87), Luke Berry (Dan Potts 72), James Collins, Kazenga LuaLua (George Moncur 80). Subs not used: Harry Isted, Lloyd Jones, Arthur Read, Connor Tomlinson. Pompey: Craig MacGillivray, Anton Walkes, Lee Brown, Matt Clarke, Tom Naylor, Brett Pitman (C, Omar Bogle 46), Jamal Lowe, Ronan Curtis, Jack Whatmough, Bryn Morris, Gareth Evans (Dion Donohue 46). Subs not used: Christian Burgess, Louis Dennis, Adam May, Alex Bass, Brandon Haunstrup. Booked: Donohue 68, Naylor 87.